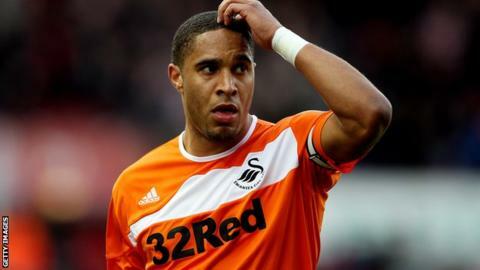 Defender Ashley Williams has admitted Swansea's performance was not good enough after defeat at Stoke City. The Swans suffered a 2-0 defeat away at the Britannia Stadium and slumped to their third straight defeat and having failed to score in the last three games. But the Wales centre-half believes it is not all 'doom and gloom' at the Liberty Stadium. "We all understand the performance wasn't good enough," said Williams. "They may have taken their foot off the gas but we created a few chances and when we get those chances we have to put them away. "We didn't get into our rhythm, but we did in spells. We are just not keeping clean sheets or scoring goals. We have a lot of work to do." Swansea failed to deal with the threat posed by Stoke's former England striker Peter Crouch, who grabbed a brace for the Potters against the Welsh side. Stoke ended their 11-match streak without a win against a Swansea side who have now lost their last three Premier League games and who have lost their goal-scoring habit. Manager Michael Laudrup, who saw his side start the Premier League campaign in blistering form, will have major concerns about his side side's defensive lapses and and lack of goals in recent games. After scoring ten goals in their opening three games the Swans have failed to score in their last three games but have conceded seven goals in the same number of games. Williams, who has made 36 appearances for Wales, admits his side's form is a concern. "We are the people who can change it but it's not all doom and gloom. We have lost three on the bounce but we started the season pretty well and we have points on the board. "We are playing well in spells and the pleasing thing is we are creating chances, but we have to get back to getting clean sheet and taking some of the chances. "That's how it goes and you have to change your luck and the only way we can do that is by working hard." Swansea's next game is against Reading at the Liberty Stadium.